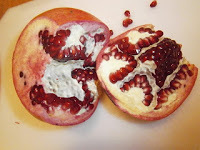 Pomegranate: a tricky fruit, if you don’t know how to deal with eat and don’t have tools. You can’t just take a knife and cut widely the fruit in 2. First cut the top of the fruit, then make 3 gashes on the sides of the pomegranate (you can go on 1 cm, as you see on the picture, the skin is quite thick. Put your thumbs on the top (the part you cut...) and split the fruit in 2. Then you have to collect the arils, the small red seeds. The best way, I think, is to use your fingers, if you use a spoon you will damage the seeds. Don’t worry, the juice is very red, but it doesn’t stain (unlike beetroot). Also remove the white skin, it is too bitter. 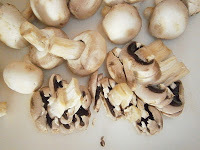 Mushrooms: what you need to know is how to clean them: unless they are completely covered with earth or dust, do not wash them in water (same goes for strawberries, by the way), because they will soak and lose their taste. 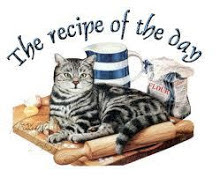 What you need to do is to moisten a cloth and clean them with it, gently, because mushrooms are fragile. To cut them, simply slice them. Bell pepper: once I had a cooking lesson and I learnt that there was a technique to cut the bell peppers that was different from the one I knew. 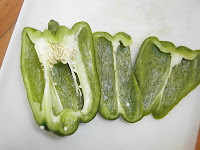 As you see, the seeds stayed together, and it is easier to clean the bell pepper. 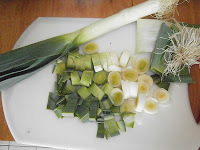 Leek: first remove the part with the threads, you won't use it. Remove also the first leave and the top of the leaves if they aren't in a good shape. Then, cut it depending on the recipe (often in slices), and only then wash them (there is always earth stuck between the leaves.